Puntiagudo, desaliñado, el eperlano… Do these words sound familiar to you? We know how good your Spanish already is, but why not to make it perfect? Ever wonder how to say something in Spanish language ? Make sure you don't ask this question ever again! Our Spanish C2 vocabulary course includes over a 1000 Spanish vocabulary flashcards which will help you on your journey of studying Spanish. Learn new Spanish words all the time and remember more Spanish nouns and verbs . We've divided them into lists by topic for better and quicker results. ¿Quieres hablar español? Learn Spanish C2 and speak one of the most popular languages in the world like a local. Over a 1000 Spanish words in our course of Spanish vocabulary flashcards will get you to C2 even if you are just a beginner. 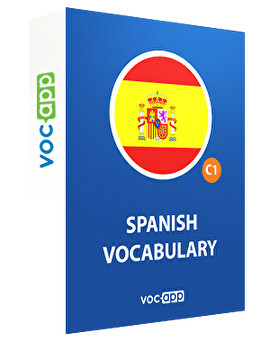 Become advanced easily with a compilation of vocabulary lists be topic and quickly get to Spanish level C2. With our flashcards you'll be able to quickly conquer C2 Spanish vocabulary and become more proficient and fluent. Say exactly what you want to say by learning more useful Spanish words. Speak like a native with our course!